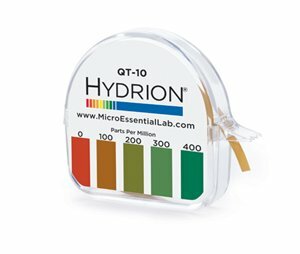 Micro Essential Hydrion QT Test has been calibrated to test the concentration of Alkyl dimethylbenzyl ammonium Compounds Roccal II, Hyamine 3500 under specific test conditions for most accurate results. The test solution should be room temperature (ideally 65-75?F). The test paper should be held in motionless solution for ten seconds and results should be read immediately. The test solution should be pH 7.5 or less. Color chart shows matches at increments of 0-100-200-300-400 ppm. Paper roll is contained in a single plastic dispenser with a serrated edge allowing easy tear off of the desired length of paper with a color chart. Roll Length: 180 inches. Test Range: 0-400 ppm. 1 Roll/Dispenser. Legal Disclaimer: Directions: Dip the strip into the sanitizing solution for 10 seconds, then instantly compare the resulting color with the enclosed color chart which matches concentrations of 0-100-200-300-400ppm. Test solution should be between 65 and 75 degrees Fahrenheit. Contact your Local, State or Federal Health Department for Quaternary Ammonium Sanitizer concentration requirements. These concentrations may vary depending on your specific application.